There are a lot of flight shooter and Tappo 2 is another one you'd like to try. 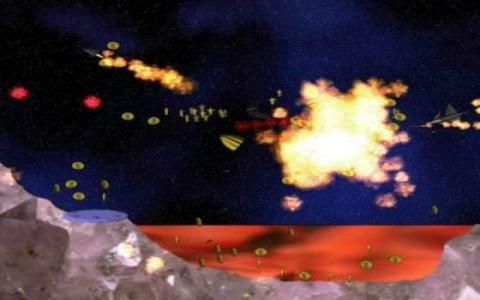 Tappo 2 is a caveflier action shooter game which has a conventional theme as is normally seen with games of this genre. The action is quite well defined and is supported by a wonderful gaming engine which provides a lot of good action and fun. The plot in the game is that you will fly a small ship through caverns and you mission is to blast and take down the enemies with the ammo and the arsenal that has been provided on the ship. The first prime in feature in the game is the designing of the level designs as the designer has gone for a lot of details in terms of the backgrounds and the terrains and they really give a realistic view of how combats would feel like in caverns. The game offers you three different game modes and all of them have their own variety of level of competitiveness. The graphics are quite alluring and levels have distinct features. The user interface in the game is also very well designed and allows for easy understanding of the gameplay. There are 25 different spaceships in the game and you can pick up different pilots which have their distinct strengths and weaknesses. Overall it is full of variety of action and is the one to be loved. Turrican 2 is the other one which you should try after having played this one.